Hello everyone. Welcome to my Journal! Finally got around to rewriting out my Journal. May take awhile to actually get it going! Mainly going to show things I've worked on and things that I like, notes and other things. Hopefully when I remember to. 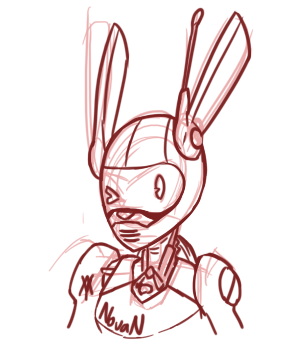 qwq !st though, how about things with me and Novan, Ye? Hobbies: Drawing, sculpting, painting, playing video games Hello Hello! 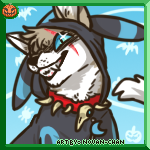 I'm Novan-chan, though I also go by Novie, Nov' and Noviechu. 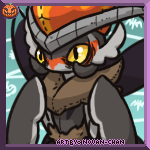 T'm the very same Novan-chan that was found on the original Pokefarm. I joined PF1 back in late July 2010-ish. I wasn't a very social user back then, often keeping to myself and doing party clicks to other users. Though, While I wasn't very social, I had always dreamed to be apart of the Site's Graphic's Team. In hopes to give back to the site that had helped with the despression issues I had. I loved the site so much. After around the 1st update about PF@ being announced, I had dropped from PF1 due to internet issues, as well as IRL Problems being more an more troublesome, etc. Years later, around mid 2014, I still had been through a roller coaster of IRL issues and depression. A lot involving with the lost of very close family. Though, of all the downs, I had some ups: I gifted various things that allowed me to draw digitally. One day I decided to check my email, which I found a message involving Pokefarm and the "Pokegold" Promotion. Seeing it was POkefarm, memories flooded from my time an excitement when I played PF1. I quickly signed up for PFQ, under the very name back on the original site. 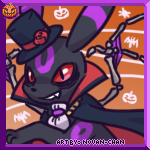 Novan-chan c: Months later, an event came up that had really caught my interests, called the Super Spook Specials, which was one of the Halloween contests played during 2014. I was really hyped about the contest and was really hyped when I saw there drawing portion of it. Though, truth be told, I didn't think I would have as a good an entry as many of the other users who entered and didn't think I would've gotten so far, as I was still new to drawing Digitally. I entered with this as my entry for the Drawing Portion of the event. About a month in after the event endded, When the Event was going through its votings, I had an amazing PM from the bwarftastic Sei, who announced to me that I was heading to the 2nd round of the voting process(and ultimately gave me my prizes) and offered me the chance of my dreams to be apart of the Graphics Team. Finally! I took on what was asked of me for "Sei's Trail": of 5 options, I did two of them. 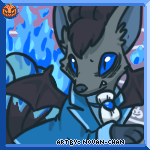 I made a fusion of Dragonair, Chandelure, Houndoom, and Hydreigon (which was teh 1st sprite fusion I ever made) and a art piece of Staff, Sei and Garth. Drawing both a Cartoony and realistic versions of their Pokesonas. So much was wrong but I was proud of it back then hahaha And ever since then, I've been apart of Artstaff. Begining of 2017, I've been promoted to Art Manager and given SuperMod rank. I've never been happier. used against the Pokemon Leagues within each Region. Info isn't currently Available. 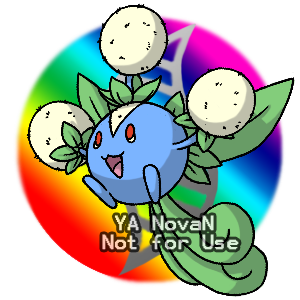 This section will hold information about Novan as a Pokemon. 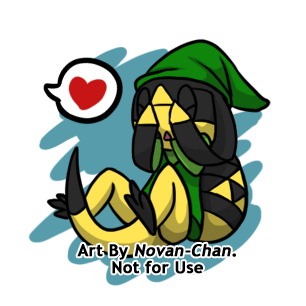 This 'verse will consist a bit of info of PMD an simple info of Pikachu!Novan. Info isn't currently Available. 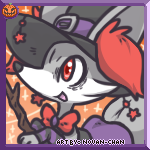 Novan-Chan and all forms of her belong to me Art for the Avatar of Novan is made by me for my use only! I wasn't a very social person back on the mother site. I would simple just stick to myself and click only the parties of other users while also admiring the awesome pokemon they had. As seen, I kept the same name I have here. I actually only stayed on Pokefarm 1 for several months and was forced to stop playing due to several things that are a bit personal. 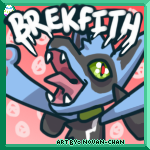 Pokefarm was actually 1 of the most active sites I would go on, others being DeviantART, Youtube and Facebook. Back then, I always had this want to be apart of POkefarm staff and work on making the stuff better. Thou, at the time, I didn't have any form of tablet to actually let me draw digitally. But I dreamed. Funny how that dream became reality huh? On POkefarm1 my starter Pokemon was, of course, a Pichu. His name was also Sai. He's just as awesome as my baby Sai on here. c: Among Pokefarm was the larger list of PFQ Exclusives. Some of the 1st Exclusives I hatched was Lunupine, Orkit, Vampire Glicar, Frost Houndour and Dracater. Yeah the most known Exclusives to be the 1st exclusives to be hatched. Of them that I loved greatly was Lunupine- which was my great pleasure to work hard on making the Lunupine that returned here on PFQ c: Since I've been on PFQ I actually returned to PF1 and wa semi active on there. I kept that Box Opening Addiction at bay by opening them on PF1. I would constantly be playing in the Dream World as well and playing around there. 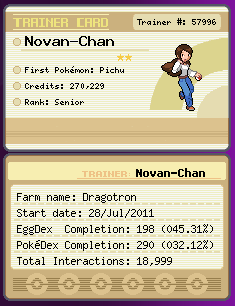 I also sorely attempted in trying to get my Idex and trying to get my Unova pass on PF1. Yeah a stupid attempt that I didn't successed in getting. But I got my Idex on there do That was an accomplishment! 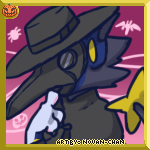 Also, in a sort of love for PF1, I remade one of its site skins here on PFQ- The Shadow Lugia Skin. While its actually still under development, its the only site skin I use. 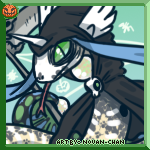 It was used back on PF1 and its used on Here too c: soooo.... yeah that's it for this one qwq bu-bai! I had no where else to actually put this, and I'm not completely looking for anything in exchange for them- as much as I wouldn't mind getting something QAQ but hey these were freely given out to fans, so why not continue that? but anyway, what I wanted to put up Sometimes, I tend to get a few game codes for either the Main Pokemon games or for the TCG:Online(rarely.) N With that "sometimes" I tend to be given/get more of said codes then I should. I happen to have a few nice friends who give me/let me get additional codes so I can give them out to those who can't go to their local game store. An since I don't have many friends IRL who play the main games or the TCG, even though the ones who I do know get a code 1st, I wanna share the rest with you guys so that they're not wasted. To whom ever happens to browse my Journal c': Which would be hardly. I don't post too often but I do update. Anyway. This will be updated often til I have none at said moment. Guys, Please be aware that I tend to update my posts that are already known, with said notification on my Trainer card, on my page. Here are what I have, right now. they'll be listed here, along with a number of how many I have left. Rules: Please take time to read, Thank you. • Go to User's page • Find the Mail card on User's About Me's bar. the 3 lil lines on the far right of the bar should have a option there to Message users • Send a PM Titled "PKMN Codes" and explain there. • Please be Polite! To those who have extra code cards an wish to give them out to users an wish to have an extra hand in advertising it. I'll be more then happy to have you listed with me for distributing Code Cards to others on site! 1: Must be code cards for the games. List the Pokemon, Card's Region, and amount of cards please. Why I ask for Region is because Code cards are region locked EX: N.America cards won't work on Europe 3DSs. 2: Please Let me know when sending me a PM that you're Ok with being listed in my about me and are ok with users PMing and asking for said Code Cards. 3: If you so Agree, Please stay up to date with me. Let me know when cards have been used, you've gotten more or that you have no more 4: At any time you may PM me to remove you and I'll do just that <3 -- For Users seeking Code cards -- Please be polite when PMing anyone from the list above. They've been generous enough to collect extra code cards for users on the site and willing to be known an accept PMs. if they have mulitple Cards, ask if they do 1 per user or not. Thank you! Code Cards I have: With a bit of info All Code Cards I have listed will be shown in the following Accordions. 1st list will show all valid codes and how many I still have along with the info on the card. The 2nd accordion has all previous codes I had that are, as of late, Invalid. • Mythical Pokemon: Mew #151 Available codes: 0 Available on: X/Y and ORAS Limit: 1 per user When Card(s) Expire: May 31,2016 Mew: lvl 100 Ability: Synchromize Item: N/A Moves: Pound Note: Celebrate the 20th Anniversary of Pokemon by obtaining the very same Mew Event that was available when Pokemon Red and Blue were the big games at the time! 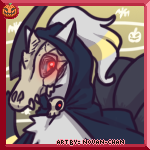 • Mythical Pokemon: Darkrai #491 Available codes: 0 Available on: X/Y and ORAS Limit: up to 2 per user for 2 games When Card(s) Expire: August 31,2016 Darkrai: lvl 100 Ability: Bad Dreams Item: Enigma Berry Moves: Dark Void, Ominous Wind, Nightmare, Feint Attack Note: Celebrate the 20th Anniversary of Pokemon by obtaining Darkrai, The Pitch Black Pokemon! 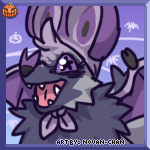 Mega Absol: Mega Lucario: Mega Lopunny: Mega Sableye: Meha Mawile: Mega Garchomp: Mega Venusaur: Mega Aerodactyl: Mega Gengar: ! Actually its 2 of 4 but you get what I mean...Right? 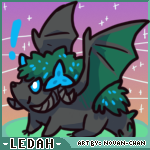 of the only sprites done by me under Ledah's approval. No, I will not show these sprites here, so if you wish to see them, find them. • M.Furret: Looker was the one who made Mega Furret's Sprite and its Shiny. 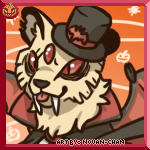 I contributed mainly by just making the art concept from fusing the former concepts done by myself, Looker and Naiyala, along side in making Mega Furret's signature Whiskers and the Mega Stone used. I also, at last minute (which caused the delay to the MCW9 event) I also made Mega Furret's Albino and Melanistic Sprites. Previously Said with M.Rapidash, I will not be showing either the Albino or Melanistic Sprites. Go find them I also felt that since I didn't make the whole sprite, I will also not be showing Mega Furret here in respects to Looker. • SHooting Star Clefable: 5/22 I've been so annoyed by how SSClefable was when I 1st made it an had it added. It was nearly the size of SSClefairy and its lines were so bold. SO what I did is I simply made it larger, tried keeping it to the pose the 1st SSClefable I did was in and I fixed the lines so its not as bold. Say hello to the new SSClefable! 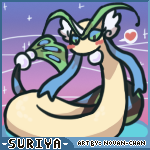 • Mega Giratina Mega Giratina has went through like 3 or 4 designs before getting its official design that is currently used. Due not being able to show everything that is intended for Mega Giratina, Everything that isn't shown will appear as its "official" Art! Due to last edits and adjustments to Mega Giratina and some Issues, Sei helpped big time in making Giratina's Melan and finishing the Albino. • Primal Dialga and Primal Palkia Sprites completely made by Key. I only made edits to their normal colors. 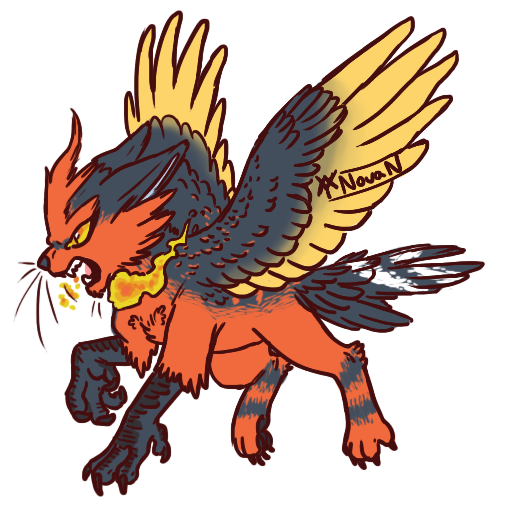 That is all c: • Litleo Sprite Made by Sei. I only edited this sprite. Widened the head, fixed its right eye, made the flame/fluff larger, fixed pixel errors, darkened Lineart, and fixed colors. "• Our images may not be used without express permission - it will usually be granted, but we prefer you ask first rather than just steal ;) " Keep in mind that sprites for Gen6 AND Exclusive PFQ Sprites are all done by the Graphics Team because Gen6 doesn't have normal sprites like Gen1-5 and PFQ Has its on line of exclusive Pokemon(encluding megas) that can only be found here on Pokefarm. Premission is needed if anyone wishes to use PFQ sprites for whatever reason. This also applies to ANY image that doesn't belong to you! How would you like it if someone took something from you that you worked very hard on and they claimed it was their's? Or even better, they scirbble on it a bit and said it their's. How would you feel, huh? you'd be very upset, wouldn't you? Then don't do it to others! Ask 1st and be truthful! So remember guys, ask 1st! ___ on a side note- Staff doesn't accept user help in making albino/melanistic sprites from users. Most of the time, its also usually has been done in violation to using site art without premission and you guys can get in trouble. Do NOT do it, please! Its obvious that Helioptile has a cute lil triangle on its head an 2(when they're closed) triangles on its skin flaps. And its Egg even references the Zegends of Zelda Tri Force. I really couldn't pass it up. 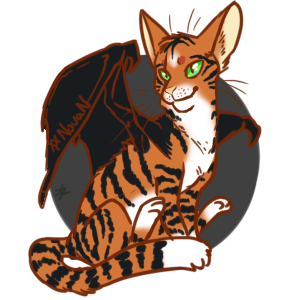 So I drew the cuteness that is Linkptile. That's most likely not the name but meh! 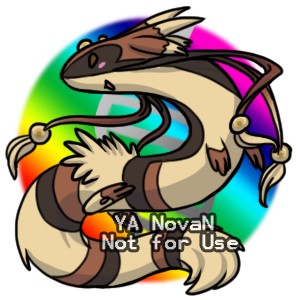 Done when Mega Furret was 1st released. Those who came to my page were given an actual drawing look of what MEga Furret looked like and gave a small tip about it. this long Normal/Dragon Mega has 4 spike looking things on its head. but in 'reality' the inner spikes are Furret's Horns and the outer spikes are actually Furret's ears! Where Normal Furret's whisker markings were are now 4 long whiskers tied with orbs on them that mark the orbs on its forehead c: its still the cute and Playful Pokemon we love! 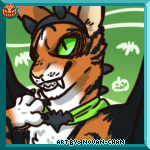 Was made half way through the Month of Halloween2015 and was also a teasing picture for the Lunupine Event. 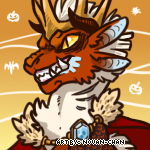 It was also a treat that showed what I was dressing up as for Halloween this year. 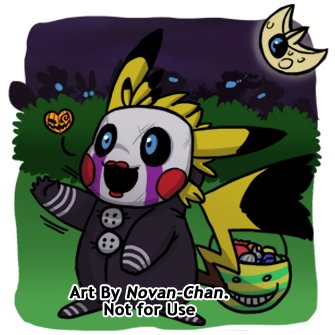 Novie is dressed up as Five Nights at Freddy's Marionette, which is what I dressed up as for Halloween, with a cute lil Kuro-Sensei candy basket with a Shiny Lunatone floating by. 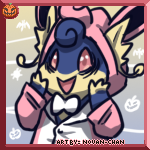 In the background, is several Pokemon wondering in the background, all of whom are facing a seeming shadowy figure which represented the Event Pokemon of Halloween 2015, Lunupine. The reasoning as why this imag ewas also apart of the Event, was Blue. Novan, along with every other figure in the image, have blue eyes. The silhoettes were a type of 'confusion' with various Pokemon back there with said blue eyes, some which were Pokemon that were quessed in the thread, such as Sylveon, Zorua(cause Mima), and Zangoose. And, because I was a mean Novie- If anyone happened to watch/read Assassination Classroom and Know well of Koro-Sensei, Those would know that I was mocking everyone. By having the Koro-Sensei Candy Basket be striped green, which Represents Koro-Sensei's Mockery face. Right click to check their pages! 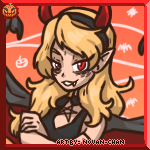 Halloween themed from Oct.17-Oct.21, Novie had taken up requests from users to make Avatars of their characters in costumes for Halloween. A few some already had costumes/etc, some took other request but were within this time. 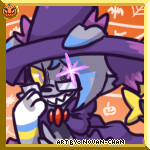 There was no Forum shop, as it would've stressed me out, but word spreads and I was in a particular mood to take up a few commissions for a wee break before the Halloween event started. Normal Avatars On rare occassion, Novie does lil avatars for few people, particularly staff. 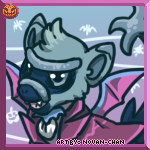 But these Avatars are mainly more lil avatars without actual themes to them, like with the Halloween-y themed ones above. Surfing, Snowboarding and Flying The New Exclusive Pichu lines! The Surfing Chus, I say, have the most Research and References put into them then all. Looked up through Pokemon anime, Pokemon Yellow version, looked up waves and looked up various Swimsuits. I went around and looked at stuff involving Surfing Pikachu which was the most commonly seen Pikachu variant in games and seen in the anime and in the manga, also being used in the old gen games. 1st lemme explain to those who don't get why the Surfing Chu line, as well the Snowboarding Chu line, have Blue eyes. For those who do, Novie am proud. Now then, The reasoning why they have Blue eyes is because of an actual Pikachu that had Blue eyes that was seen. No its not me but thank you. No. This Pikachu is named Puka. Puka is a Pikachu that was able to feel the ocean and tell when big waves were coming. It was slightly larger Pikachu than Ash's Pikachu and it was a sweetheart. Puka appeared in EP067 "The Pi-Kahuna" ((Or "The Legend of the Surfing Pikachu" in Jap)) and was the only Episode Puka was seen in. Here's Puka! This is why Surfing chu line has blue eyes. I wanted to reference the Pikachu that the Chu line is based from. And, if anyone wants further explanation, Snowboard Chu line also has Blue eyes because you need a Surfing PIchu to get a Snowboarding chu. That's why. Funfact: Novie loved Puka's episode when she was lil. It was that one, EP039 "Pikachu's Goodbye"((Or "Forest of Pikachu" in JAP)) and EP014 "Electric Shock Showdown" ((Or "Electric Shock Showdown! Kuchiba Gym" in JAP)). These are among several episodes Novie loves. Surfing Pikachu's Pose in particular has its own lil 'reference' to it if you guys want me to really get deep. Its Pose is based on the very tiny sprite seen when having Pikachu use Surf in the old Gen games, and popularly seen in Pokemon Yellow's opening and in its minigame "Pikachu Beach" While Pikachu is posed to be like that of the Surfing Pikachu in the old mini game, Surfing Raichu was posed like it was going down a wave. Surfing Pichu, while based off the old sprite, it was edited with its feet together as if to go "Can we go!? PWEASE!?" Now, onto the boards, swimsuits n floaties. Pichu's floaty was changed to match up that of the swimsuits on Pikachu and Raichu. So they were changed from floaties with pokadots to stripes. The swimsuits were very fun to make. I went around to get an idea about them Cause, while I didn't mind the trunks, I didn't enjoy the Bikini. They didn't look very appealing and didn't fit so well on the Chus. I would've thought a lil better if it was like one of em 2 pieces lil kids wear but no, it was a string bikini. A string Bikini on a mouse, It looked horrible to me. I ultimate came to the conclusion to have them wear form fitting outfits that matched rather than keep the trunks and bikini (*Shivers*) I browsed around Google checking out various swimsuit designs to get what I liked most. The female suit, which was worked on after the male's ((Worked on Pikachu before Raichu)) mainly branched off what I had already got from the male's Til I thought "eh" and added the white patch on the chest. FunFact: Since the Female's had the full suits, I wanted the male's to stay cool too, So I added a necklace that sported a "Sharpedo's Fang". Cool uh? So stereotypical surfer XD The Surfboards, those were fun. Its pretty obvious I love references, so I ditched those surfboards that were seen on the old sprites and I absolutely love the new ones. Surfing Pikachu's board is completely based on the surfboard that can be seen being surfed on by Yellow's Pikachu in the Pocket Monster's manga, in Chapter 44 "The Fake Pikachu", where Yellow's Pikachu uses it against Red's Pikachu. Raichu's surfboard, on the other hand, wasn't one that came from the manga but a game. Instead of keeping the same board, it gets a new board that supports its size. The board that Raichu has is none other then the surfboard that's seen on the Beach course of the game Pokemon Snap. Both Pikachu and Raichu's boards are colored depending on their genders. FunFact: The Surfing chus were the easiest for me to do, not only cause they were the 1st but because I had already had what I wanted to do with them since before making them. The only difficulty was positioning the board and making the water. Flying was 2nd difficult and the most was Snowboarding, due to their action. 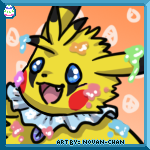 Which what I tried to make look similar with my Flying Pikachu but its pretty obvious they don't looke exactly alike. which is good an bad. Cause I wanted to it look like it but still happy it doesn't cause its it own. 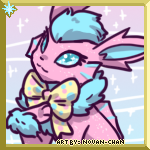 Raichu, like the snowboards, was done all on my own and several times of me screwing around with it to make sure it looked good qwq. That one was a long one to go an do. Man the feet were the biggest pain qwq FunFact: While I was still super hyped about the chus, it was still frustrating. Flying Pikachu went through 2 poses before getting what I got and Flying Raichu had 1 other pose. the Snowboards were the most difficult cause I was trying to give them more action. That Pikachu going through 3 while Raichu went through 2 with long spans of time of trying to get the boards right. 10k in what? Well just lil while ago (since I'm 26 hatches late), I checked my chain count to see where it was right now since I last checked it. Seems that my Pichu hunt, that I started over a year ago that started around late December 2014 to early January 2015(( and has been slowly to actively worked on while I help make pretty art stuff)), has just hit the hatch chain of 10,000. Right now, when this post was made, my Pichu Chain sits at 10,026 Hatches with over 204 Shinies, Arcues knows how many Albinos and 2 Melans. Aside that over 9.5k of those Pichu were also normal colored that were hatched, All of which have helped me rank up my badges along side those users who helped me get to the current badge I have((Wishalloy at the time this was posted)). Of the Pichu I've hatched, I do have the 3 1st Pichu of their S/A/M colors, aside from Sai, the Pichu I started my PFQ Journey with c:, all of my 1st Pichu have long since evolved, and are to stay, as Pikachu! : • My 1st shiny was a Female Pichu, Sakura, who was hatched 1/279 in the chain and hatched on January 21, 2015. 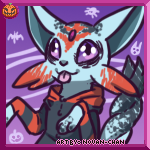 • My 1st Albino was a male Pichu, Tip, who was hatched on February 19, 2015 • My 1st Melan was a Female Pichu, Yami, who hatched 88/3850, in the chain and hatched on July 11, 2015 Only reason why I haven't stopped or given up on this Chain is because out of all the Pokemon on site that have albinos and Melans, the Pichu line is the only line I really really love so much to try this long in getting its whole Evolutionary line plus its PFQ Mega Evolution in all 4 variant colors. While my 1st goal was just to get 1 melan, the goal grew to get 4 total. Getting a 5th Melan Pichu is the long shot idea. But I'm not giving up on it. I may not have good luck in getting albinos often, but I'm still going to try! even if it takes me another 10k, I'm getting my family of Pichu!